This guest blog has been written by Poppy Brown – author of a 2016 HEPI report into The invisible problem? Improving students’ mental health. It has been timed to mark University Mental Health Day 2018 – a great opportunity for the whole university community to join together to make mental health and wellbeing a priority on campuses across the UK. A new piece of research by the charity Student Minds has revealed just how much academics are struggling under the burden of supporting students with mental health problems. To many, academics might have a reputation for being too uninvolved in pastoral care, with humanities students in particular often having very limited contact hours. However, interviews with 52 academics in varying roles across five universities demonstrates that in fact, academics are often students’ first port of call when facing a crisis. Thus academics are forced to play an extremely active role in supporting their students, whether or not they have the time and skills to do so. A major strength of the report is how much it brings out the real risk that is involved with this current set up. Individuals are easily influenced when in a vulnerable state. Having untrained academics repeatedly having to provide advice and support to students in a crisis is dangerous. But if there is high risk even in the cases of academics who are understanding, empathetic and willing to provide time and support, it is worrying to think about how high the risk is in the cases of academics who are not empathetic and understanding towards mental health issues. A sampling bias may exist in the report, whereby the most caring and invested academics are more willing to partake in this kind of research. Some students who turn to an academic for help will not be given the dedicated support that the participants in this research are giving. Universities need to debate and define academics’ roles and the boundaries of their support, recognising that some sort of role is unavoidable. How to provide support while maintaining and communicating boundaries to students. 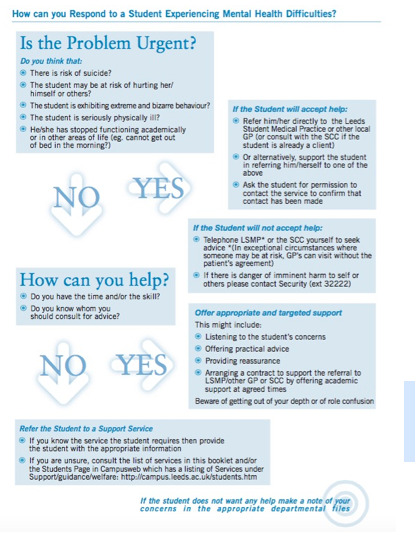 Signposting students to support services. Managing both the emotional and time burden of supporting students. Better resourced student support services are needed. There should be more communication between student support services and academics. Universities should consider integrating wellbeing development into the curriculum. Some may read the report and feel frustrated by the call for better resourced student services and training of academics, echoing a large number of other calls for more investment. Providing the necessary training to academics and properly resourcing student support services would of course cost a significant amount of money. However, it can have a high return on investment. As noted in the 2016 HEPI report, Ruth Caleb, head of Counselling at Brunel University, estimates that her services save the university approximately £2.5million in fees that otherwise would be lost due to students dropping out. The situation within universities echoes the global mental health situation. Mental illness is the largest single source of world economic burden, estimated to be between £70-100 billion in the UK alone. Yet, in 2008 for example, the Government Office for Science estimated in a report that over £1 billion could be saved each year just by extending NICE-recommended treatments to all those with depression; a figure that vastly outweighs the treatment costs. Any research that includes policy recommendations that imply the need for more funding ought to justify their claims with these kinds of figures. I hope Vice Chancellors begin to recognise the need for properly resourced support services, and note the urgency that is clear from this report. If academics are at such a ‘breaking point’ then the issues around student mental health cannot be ignored any longer. The qualitative nature of the report makes it clear just how desperate many academics are. They should not feel that they have to take a student away with them on their vacation, just for fear of what would happen if they did not. Today, on University Mental Health Day, over 100 Universities, Students’ Unions, volunteer student groups and related services will be coming together on campuses all across the UK to run a number of diverse events designed to open up community conversations about student mental health. Together we can make mental health and wellbeing a priority on campuses across the UK! ← What do students really think about tuition fees?